Looking for better control over the natural light in your house? Want to replace your sun-damaged windows for something more striking? Consider adding vinyl windows to your home in Calgary, Edmonton, Saskatoon or Red Deer with the help of professionals from Great Canadian Roofing & Siding. Although you might be tempted to install windows yourself, take into consideration the role that windows play in your ability to heat and cool your home. You want to take every precaution to make sure your product is functioning correctly. 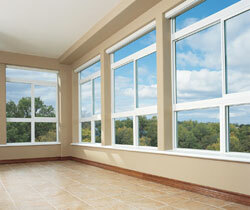 Choose the window installation company with nearly 20 years of experience in residential and commercial construction. At Great Canadian, we promise our customers the best quality in all aspects of the job, from the workmanship to the windows themselves. Energy efficiency – Often windows are the biggest contributor to energy loss, but our products serve as natural insulators. Easy maintenance and durability – Our vinyl windows are designed and engineered to block out or let in natural elements with little to no maintenance. These windows are not easily worn by the sun, so you can enjoy your windows longer without repainting, replacement, or repairs. Less susceptibility to moisture – Along with being durable, vinyl windows will block out moisture better than other types of windows. Customized look – We can fit your windows to the exact size you need in your home or office building. Lower cost – Because vinyl is less expensive, you can heat and cool your home without breaking the bank. Here at Great Canadian Roofing & Siding, we have many years of experience installing vinyl windows in Calgary, Edmonton, Saskatoon and Red Deer. We’re more than happy to answer any of your questions. We can even discuss with you the installation process and provide you with a free quote for windows and installation costs. Simply call us today or visit one of our locations in Calgary, Edmonton, Saskatoon or Red Deer.